Watering eyes is a common condition, particularly in young babies and older people. A blocked tear duct is the most common cause, but there are numerous other causes. It can occur in one or both eyes. An operation can usually cure a blocked tear duct. However, treatment may not be needed if symptoms are mild. Other treatments depend on the cause. Watery eyes are a common condition, particularly in young babies and older people. A blocked tear duct is the most common cause, but there are numerous other causes. Chemical irritants such as onions, fumes, etc. A small scratch to the front of the eye, or a piece of dirt which gets stuck in the eye. An Infection in the front of the eye (infective conjunctivitis). An allergy causing inflammation in the front of the eye (allergic conjunctivitis). Eyelashes that grow inwards can irritate the front of the eye. Abnormalities of the tear film. For example, the chemical content of tears may not be right. This may cause the tear film to spread unevenly across the front of the eye. Patches of dryness may develop which can become sore and cause your eyes to water. Thyroid eye disease is an uncommon cause. Tears may become blocked in the drainage channels. The most common cause of watering eye in adults is a blockage in the tear duct just below the tear sac. This is believed to be due to a gradual narrowing of the upper end of the tear duct, possibly caused by persistent mild inflammation. If you have a blocked tear duct, not only will you have watering eyes, but stagnant tears inside the tear sac may cause infection. If the tear sac gets infected you may notice a sticky discharge on the eye. This may also lead to a painful swelling on the side of the nose next to the eye. Sometimes the tear duct is not fully blocked, but is too narrow to drain all the tears effectively. Less commonly, there may be a blockage within the canaliculi, or the entrance to the canaliculi (in the inner corner of the eye) may be blocked. This can be caused by inflammation or scarring. Some babies are born with a tear duct which has not fully opened. This is common and usually rectifies itself within a few weeks without any treatment. Ectropion is a condition where the lower eyelid turns outward away from the eye. The ectropion can cause tears to roll off the bottom of the eyelid rather than drain down the canaliculi to the tear sac. Sometimes the cause is easily identified but if there is no obvious cause then further tests may be advised. It all depends on how bad the watering is, and how much it bothers you. If a drainage problem is suspected, a specialist may examine the tear drainage channels, under local anaesthetic. A thin probe is used to push into the canaliculi towards the tear sac to see if there is a blockage. If the probe goes all the way to the tear sac then fluid is syringed into the tear duct to see if it comes out in the nose. Syringing can sometimes be enough to clear a blockage, but it may only give temporary relief. If there seems to be a blockage then a dye can then be injected into the tear duct. An X-ray is then taken. The dye will show up in the duct on the X-ray. This was you can see the exact location of any obstruction or narrowing in the tear duct. Eyelashes irritating the front of the eye (entropion) can be removed. Conjunctivitis is usually treatable with drops. Pieces of grit can be removed. Ectropion can usually be treated with a simple operation to the lower eyelid. Babies with watery eyes usually grow out of it with no treatment needed. Blockage of the channels in adults. You may not need treatment if watery eyes are mild or do not bother you much. A blocked tear duct can be treated with an operation. The usual operation is called dacrocystorhinostomy. (DCR) A new channel is made, going from the tear sac to the inside of the nose. 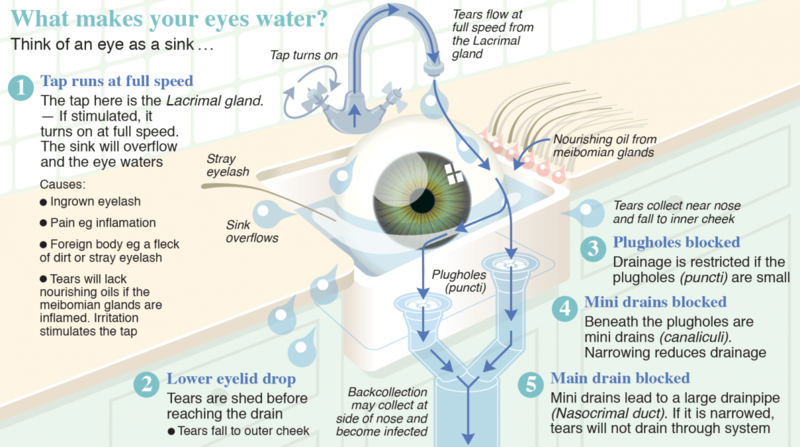 Tears will then bypass any blockage further down the tear duct. An alternative but less common operation is to inflate a tiny balloon inside the tear duct to make it wider, or insert a device called a stent to hold open the walls of the duct. A narrowed canaliculi which is not fully blocked may be widened using a probe. For the next available watery eyes appointment you can contact us by emailing londoneyeunit@hje.org.uk or by calling our team on 020 7078 3848.